Do not mow, cut or otherwise disturb treated vegetation, weeds or plants for at least seven days following application. 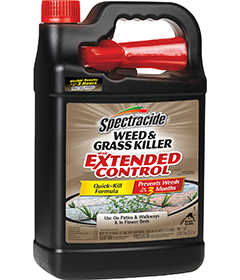 Refill only with Spectracide® Weed & Grass Killer With Extended Control Concentrate. Remove cap. Carefully measure and mix 7 fl oz (14 Tbsp) in 1 gal of water. Replace and tightly close cap. Wipe off any spilled product. Pesticide Storage: Store in cool, dry area away from heat or open flame. Pesticide Disposal: Nonrefillable container. Do not reuse or refill this container unless the directions for use allow a different (concentrated) product to be diluted in the container.